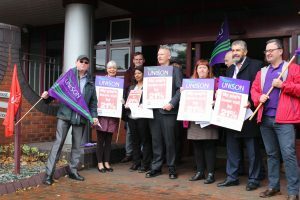 Our employers across the West Midlands met in Sandwell on 21 July to discuss the joint union pay claim for 2018 of 5% plus the Living Wage at the bottom of the pay spine. With the support of West Midlands region of UNISON we organised a joint union lobby of our employers to press home the value of our claim. Since 2009 the value of pay across local government and for school support staff has fallen by a staggering 21%! Imagine earning a fifth more than you do now and that is what we have lost out of since the start of the cuts. The reduction in our pay has not stopped the job losses. During this period we have also seen 750,000 jobs lost across local government! The Tories 1% pay cap is under political pressure as inflation is once more hitting 3.5%. The Joint Trade Unions are determined to put as much pressure on as possible to scrap the cap. Help your union and join us when we protest outside the Tory Party Conference on 1 October in Manchester.